The Manitoba government recognizes that a diverse civil service allows us to better represent and serve the citizens of our province. Diversity is an important component of our civil service renewal efforts. 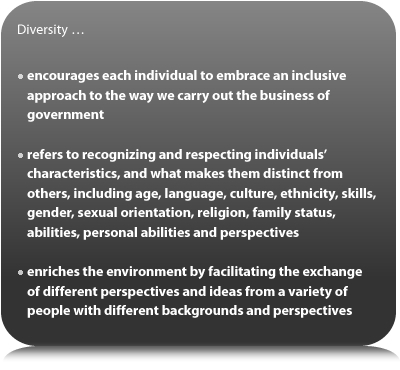 The Manitoba Government Diversity and Inclusion Strategy is our approach to building an exemplary civil service that is inclusive and reflective of the population it serves. We welcome diversity in our workplaces, and aim to foster an inclusive work culture that recognizes and values the talents of all employees. To recruit from a diverse, qualified group of potential applicants to build a representative workforce, at all levels of the organization. To identify and remove employment barriers to enable the full participation of all employees. To cultivate a culture that motivates individuals to contribute to their full potential and build a career with a high-performing Manitoba government. increased recognition of how diversity and inclusion positively impact performance, engagement and innovation. Senior leaders in government are committed to these goals and are working within their departments to achieve the goals of Diversity and Inclusion. In addition to the work being carried out in departments as part of the strategy, we also offer a number of Internship, recruitment and development programs that provide members of employment equity groups access to employment opportunities in the civil service, and learning and development programs to help current employees succeed in their career in the Manitoba civil service. Employment equity refers to positive steps taken to attain a representative civil service and continue progress towards increasing the representation and retention of four designated groups at all levels of the organization. Our Employment Equity Policy promotes these goals and is based on the principles of fairness, merit and equity. Applicants for positions are encouraged to self-declare as a part of their application. Current employees can self declare by completing an Employment Equity Declaration Form and submitting it to their department human resource services office. See Employment equity in the competition process for more information on how employment equity is applied in our recruitment practices. A diverse group of employees that represents the public often leads to understanding the issues and concerns of the citizens we serve in a more complete way. A diverse group of employees can enable a workplace to come up with a variety of unique ideas and approaches to an issue, and it can often lead to creative, innovative solutions. By providing a safe working environment and a manager who demonstrates the importance of diversity, employees with varied backgrounds can become more comfortable within the workplace. This encourages employees to be actively involved in the workplace, as well as share and discuss work issues and ideas with each other, leading to increased satisfaction levels of employees, as well as higher productivity and quality results. A workplace that promotes diversity also promotes itself as a place of employment, which can be effective both at retaining employees and hiring new employees.